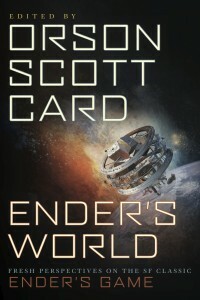 I was invited by SmartPop and Orson Scott Card to be a part of ENDER’S WORLD — a collection of essays about the Enderverse compiled and edited by the creator of Ender himself. ENDER’S WORLD will be available February of 2013. It’s not up on Amazon just yet, but you can check out what’s happening at the Ender’s World SmartPop book page here. My contribution is “Mirror, Mirror”, an essay on four of the main characters of the Enderverse, their counterparts in the world of fairy tale, and what that means to the reader. SmartPop is going to be doing some really fun promotion around this one–be sure to check back. I promise to keep you posted! This entry was written by Princess Alethea and posted on August 11, 2012 at 5:04 am and filed under Essays. Bookmark the permalink. Follow any comments here with the RSS feed for this post.